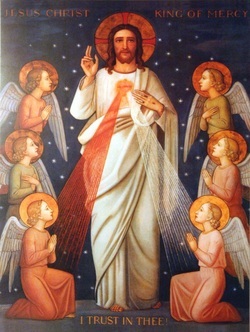 The establishment of the Feast of The Divine Mercy on the octave day of Easter fulfilled the purpose of the restoration of the liturgical year, allowing "the faithful through their faith, hope and love to share more deeply in the whole mystery of Christ as it unfolds throughout the year" (Moto Proprio of Pope Paul VI, 1969, on the Liturgical Year and Roman Calendar, quoting Vatican II on the Liturgy, 102). It ensures even greater prominence to the paschal mystery of Christ, so that the faithful more effectively "lays hold of the mysteries of Christ and are filled with His saving grace" (Ibid). How does it achieve these purposes? In a number of ways: The Feast of Mercy has its roots deeply planted in the Old and New Testament and in the early Church Tradition. It is a feast with three distinct dimensions, each emphasizing an aspect of the paschal mystery that needs to be brought out more clearly and appropriated by the faithful: merciful love, atonement, and covenant. The Triduum of Holy Week, along with the entire Easter season, focuses on various aspects of the paschal mystery. Holy Thursday celebrates the Mass of the Chrism and the evening Mass of the Mandatum - the washing of the feet of the disciples, ordination to the priesthood, the institution of the Eucharist, and the last discourse of Our Lord promising the sending of the Holy Spirit. Good Friday commemorates the passion and death of Jesus on the cross. The Easter vigil, the pinnacle of the paschal mystery, celebrates the fulfillment of the prophecies of the Redeemer who is our light and salvation, bringing us new life by water and the Holy Spirit. The Easter season continues this celebration, leading to the Ascension of the Lord and to Pentecost - the fulfillment of the promise to send the Holy Spirit. The Feast of Mercy focuses on God's mercy as an event! It focuses on God's continuing action of mercy throughout salvation history as we see it recorded in the letter to the Romans, chapters 9, 10,11, culminating in His loving plan to have mercy on all! (See Rom 11:32.) This Feast is a summation of the event to His mercy active in our lives now. It is because of His mercy that we have forgiveness of sin and new life as children of God. This needs to be celebrated! The Feast of Mercy is the fulfillment of the Old Testament Day of Atonement (see Lv 16, Lv 23:26-32 and Sir 50). It is a day of forgiveness of sins for those who approach the Eucharist and the Sacrament of Reconciliation. It is an annual celebration like the Day of Atonement - all sins and punishment are washed away in His infinite mercy. The focus of this paschal event is on God's mercy for us sinners and His free gift to those who turn to Him with trust. Interestingly enough, the texts of the liturgy for that Sunday (Second Sunday of Easter) already focus on the forgiveness of sins and mercy. The gospel is of Jesus appearing in the upper room and bestowing the authority to forgive sins (see Jn 20:19-5 1), and the other readings are about the blood and water and the proclamation of mercy (there was no need to change the texts)! The octave day has its roots in the Old Testament and New Testament as the Day of Covenant. On the eighth day after His birth, a male child was circumcised as a sign of the covenant and given His name (Gen 17:12-14; see also Lk 2:21 for the circumcision of Jesus). In the early church the newly baptized, newly born in Christ, wore white robes until the Sunday in White ( Dominica in Albis) the octave day of Easter, symbolizing their innocence. The Feast of Mercy once again celebrates the white innocence we receive by the Covenant of Mercy. Like the covenant of Sinai we, too, prepare for the Feast by purification from our sins and by the sprinkling of blood and proclaiming of the law (Ex 19:14-15; Ex 24:6-8) - but this time we are cleansed by the precious blood of the Lord and the Proclamation of His mercy. Interestingly enough, all the elements of creation are structured in units of eight (as seen in the periodic table), and musical chords resonate with the octave. The Feast of Mercy is the octave day of the Resurrection, which strikes the resonant chord of Easter, developing the meaning and richness of the paschal mystery and applying it in a new and deeper way. It resonates with all of nature, sounding anew the grace of the resurrection, alleluia! As we have seen, the reasons for establishing the Feast of Mercy are strong and clear in themselves. The Feast is rooted in the Old Testament, and an earlier form of the Feast was celebrated from the fourth century as Dominica in Albis. But, in our times, there is an additional reason that makes the need for the Feast of Mercy ever more urgent, and that strengthens the meaning and effectiveness of such a feast for the faithful. In a series of reported revelations to Saint Faustina Kowalska, Our Lord specifically and repeatedly asked that the Feast of Mercy be established on the octave day of Easter. The idea of this special celebration of God's mercy on the Sunday after Easter is not a new or radical idea stemming simply from private revelation. Our Lord, through Saint Faustina, is simply reemphasizing what was strongly urged by Saint Thomas the Apostle in the earliest liturgical document in existence, the " Apostolic Constitutions." There we read: "After eight days (following the feast of Easter) let there be another feast observed with honor, the eighth day itself on which He gave me, Thomas, who was hard of belief, full assurance, by showing me the print of the nails, and the wound made in His side by the spear." This feast had been celebrated in the early Church. We now have the key to understanding the Image of The Divine Mercy with its rays signifying the Blood and Water that flowed from Christ's pierced side with the inscription (Jesus, I Trust In You), and to Our Lord's insistence that this image be specially venerated on the first Sunday after Easter, which is to be celebrated as the FEAST OF MERCY (Divine Mercy Sunday). We can also see these rays as simultaneously symbolizing the Holy Spirit, whom Christ breathed into the Disciples during the same Octave-day appearance. On the strength of that Holy Breath, all sins are forgiven and "at-ONE-ment" with the Father is accomplished. Here, God in Christ is reconciling the world to Himself (see 2 Cor 5:18). And here the Church, the newly-born Body of Christ, is commissioned to be the instrument of reconciliation down through the ages. This is Christ's GREAT PROMISE of complete pardon of sin and punishment on the Feast of Mercy through the reception of the Sacraments (which is a participation of Christ's death to sin and rising to divine life). In preparing for the Feast of Mercy we are to make a novena of Chaplets to the Divine Mercy (beginning on Good Friday), and to be purified by the sacrament of Reconciliation. Priests are to proclaim the mercy of God. The Image of Jesus, the Merciful Savior, is to be blessed and venerated as a reminder to trust in Jesus and do works of mercy. And we are to renew, ratify and seal the covenant of mercy by receiving Holy Communion. The day of the Feast is celebrated by using the normal liturgy for that day (Second Sunday of Easter), as per decree dated May 5, 2000 for Divine Mercy Sunday, which are all focused on mercy, and a homily on God's mercy. Our Lord is asking for a Feast of His mercy to bring attention to the outpouring of the ocean of graces, and to His promise of the complete forgiveness of sins and punishment, to the souls that will go to Confession and receive Holy Communion. Those who have been celebrating the octave of Easter in this way, as the Feast of Mercy, have experienced the desired effect of the Second Vatican Council for the liturgical year renewal - a deeper share in the mystery of Christ.